The F4Z is the first motorcycle that Zagato have ever designed, and it's brilliant! 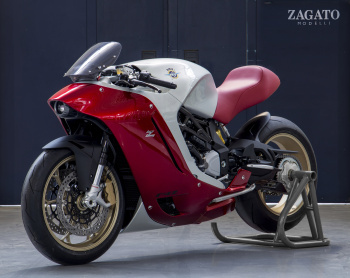 Now that Massimo Tamburini is no more, MV Agusta have had to turn to the Milan-based automotive coachbuilder, Zagato, for a special one-off motorcycle that looks like nothing else on the planet. The thing about Zagato is that they don't do 'nice.' Cars designed by Zagato are a bit dark, a bit menacing. If Zagato were human, he might be Ronnie Kray, in the movie Legend. Not to be messed with. Some of Zagato's best work has been with Aston Martin (we love the DB7 Zagato and the DBS Coupe Zagato Centennial), though they also built some brilliant cars for Alfa Romeo and Lancia. And yet, a collaboration between MV Agusta and Zagato is not necessarily a recipe for success. Whenever car designers have turned their attention to motorcycles, the results haven't always been very good. Remember the Pinifarina-designed Morbidelli V8" Or the Lamborghini Design 90" Er.. yeah, well. Then again, the F4Z is different. Unveiled at the third international Concours d?Elegance Chantilly Arts & Elegance, it's the first Atelier motorcycle that Zagato have ever designed and... we think it's not bad at all. Sure, it isn't 'beautiful' in the conventional sense, not in the way you'd call an F4 or a 916 or a Panigale 'beautiful.' Of course it isn't. It's been designed by Zagato, who don't do 'nice,' remember" It's low, mean, hunkered-down and subtly aggressive. If Ronnie Kray were a bike, he might be the F4Z. The F4Z, built as a one-off machine for a wealthy Japanese collector (who collects Zagato cars and Italian motorcycles), is based on the regular MV F4 and is built with aluminium and carbonfibre. The bike consists of a small number of relatively large panels, a characteristic which sets it apart from more mundane, mass-produced machines. The MV Agusta F4's inline-four engine, chassis and suspension are all stock items, but the intake manifolds, fuel tank and exhaust system are all bespoke.